Elevation, plan and section of the east end bay of the Chapel Royal, illustrating the proposal in elevation and plan. This drawing is the finished, accepted scheme, from a preliminary design in Dickinson's hand in the British Museum dated 5 December 1710 (see Thurley, Hampton Court, fig. 201), which shows alternatives for the design of the reredos, the left version of which was adopted here, and drawn more carefully as a full elevation, accompanied by a side elevation (2; 111/51). 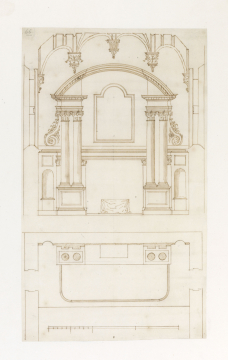 As work began on the new altarpiece and reredos in January 1711, this revised drawing was probably made shortly after the preliminary design. The two-column frame was the grander of the two options in the preliminary design. As Thurley notes, Anne was fervently committed to upholding the Anglican faith and on her accession had made plans to enlarge the chapel at St James's Palace, in order to give it the 'form of a cathedral' (Thurley 2003, p. 217). This unexecuted work anticipated her enrichment of the Chapel Royal at Hampton Court. The design omits the carved enrichment around the reredos panel and within the end-panels of the broken tympanum that is shown on the preliminary design, but this was carved on the reredos itself, presumably by Gibbons (Thurley, fig. 202). Dickinson's hand is recognisable from his scale bar convention, his shaky freehand drawing, his mid-brown ink, and the general looseness of his ruled and freehand line drawing and shading, all of which distinguish his techniques from those of his older colleague Nicholas Hawskmoor (compare also Dickinson's designs at 111/49, 50).